Many Twitter users responded to the photo of the 1983 coupon used at North Shore Farms in Mineola by sharing their old coupons and stories. This is taking extreme couponing to the next level. 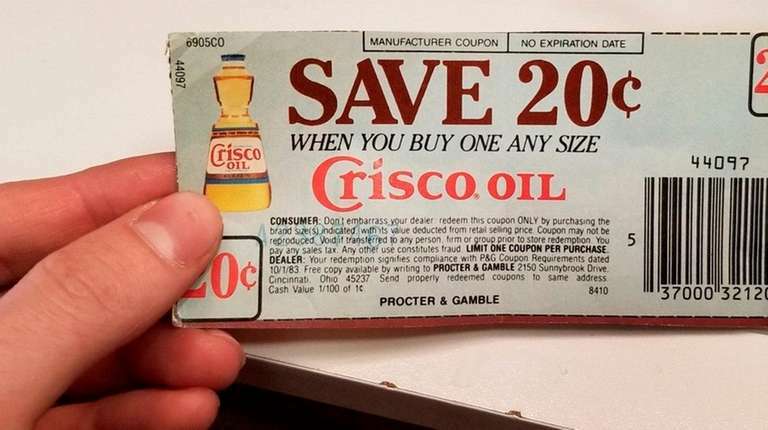 A customer at North Shore Farms in Mineola this week successfully redeemed a 36-year-old coupon to save 20 cents on a bottle of Crisco cooking oil, the grocery store's manager said Thursday. Manager Anatoly Shashkin said he accepted the coupon from an unknown customer Tuesday — without scanning the bar code — because it did not have an expiration date. “It looked like it should’ve worked — It looked old but not super old, like it was from an old magazine. But we didn’t realize how old it actually was until later on,” when he looked closer and saw the year was 1983, Shashkin said. Shashkin said that the store previously had a loose policy accepting coupons, willingly accepting most if they seemed legitimate. “That policy’s changed now,” he said with a laugh. Shashkin said that most coupons now will be scanned. The coupon is branded Procter & Gamble, as it was made long before J.M. Smucker Co. bought Jif peanut butter and Crisco cooking oil brands from the company in 2001. According to the thebalanceeveryday.com website there are common coupon policies that most stores follow. Coupons must have a bar code that can be scanned; there should always be a valid remit address; and coupons should have expiration dates or "No Expiration Date" printed. If a store fails to follow these policies, it risks not being reimbursed by the manufacturer. Recognizing its novelty, Shashkin tweeted a photo of the vintage-looking coupon that quickly went viral — by Thursday morning it had nearly 2,300 retweets and 13,000 likes. Many Twitter users responded by sharing their old coupons and stories after seeing Shashkin’s tweet.